Consider what type of storage media the digital camera uses. SmartMedia is flimsy because its connecting wires are outside the cards. Memory stick is proprietary to Sony devices only, so it's not considered industry standards. Compact Flash card is by far the best bet because it is thick and hardy. Many output devices eg. printers and projectors use the card as storage device, so images stored can be output straight away in these devices. Traditional camera uses film to record images. 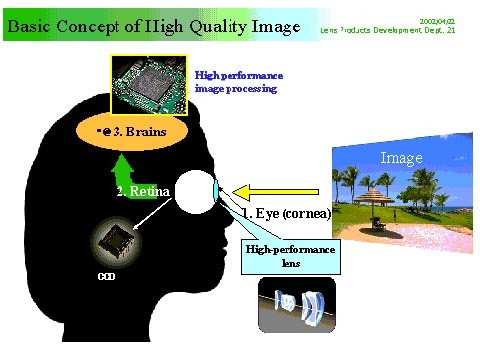 But for digital camera, the film is replaced by a small sensor chip - either CCD (charged Coupled Device) or CMOS (Complementary Metal Oxide Semiconductor) - which stores the image into a digital format. Firstly, identify the subject that you are interested to emphasize. Next compose your picture using the LCD. Ensure that only the things you want viewer to see appear in the LCD screen. If you are taking a moving object, always leave enough space in front of the subject so that it appears to be moving into the picture. Now take the shot and you'll end up with your full image size "framed" the way you like it. If you are not happy with the composition, reshoot it. The new range of digital cameras comes with a USB cable for fast connection to PC. Just download the software and get the digital camera to 'talk' to the PC. Once your photos are loaded into your PC, convert the image from its original format (usually a .tiff or .gif) into a .jpeg file. This is the most common way to send images because they are "compressed" and load faster. After the connection, organise the digital images using bundled album software like ZoomBrowser to help you organise your picture. Remember to delete those pictures you do not want or it will take up too much memory space. Make sure your recipient uses an e-mail program (like Microsoft Outlook) that allows him or her to view attachments. Then scan your "best" photos. Limit your attachments to 1 or 2-they will load faster. Resolution is the measurement of an image in pixels. Since the maximum available resolution of an image is only getting higher, digital cameras use a process known as "Compression" to reduce the size of the image to a manageable size before it is stored. While this dramatically increases the amount of pictures you can store on each memory card, there is a trade off in quality.